For Affordable Health Insurance, Some States Look To Build On Medicaid : Shots - Health News While some officials urge expansion of the Medicare system, several states are mulling a different way to ensure residents have affordable coverage: help them buy into a Medicaid-like plan. Leah Steimel (center) says she would consider buying insurance through a Medicaid-style plan that the New Mexico Legislature is considering. 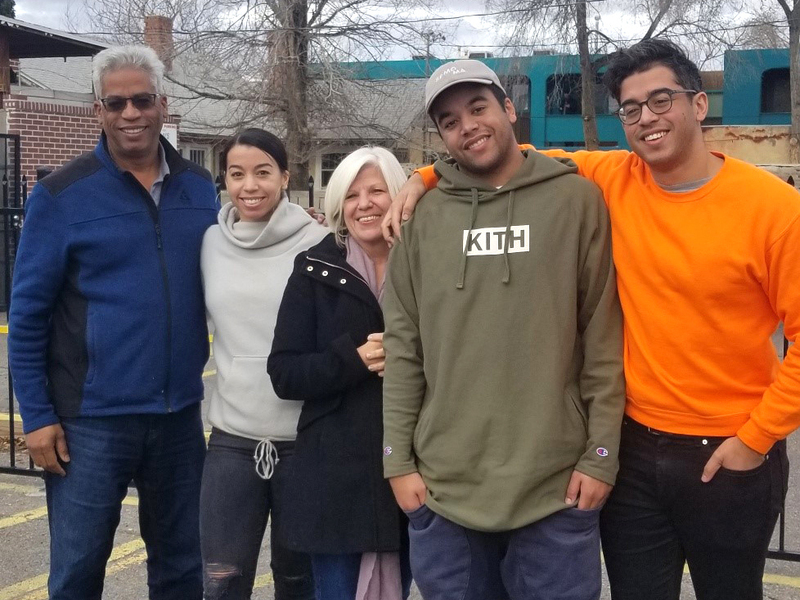 Her family includes (from left) her husband, Wellington Guzman; their daughter, Amelia; and sons Daniel and Jonathan. Laura Lucero Y Ruiz De Gutierrez has a heart condition and fibromyalgia and is at high risk of developing diabetes. She has health insurance through her husband's job. But between the $800 monthly premium for the couple's coverage and the $2,100 deductible she has to pay down before insurance starts picking up the tab, she doesn't feel she can afford to go to the doctor when she needs to. She hopes that this may soon change. Identical bills proposed in recent weeks in the New Mexico House and Senate would make Gutierrez eligible to buy into a public health plan modeled on the Medicaid program, with funding support from the state of New Mexico. She could receive state-funded assistance via the program that would save her hundreds of dollars a month on premiums. Laura Lucero Y Ruiz De Gutierrez has health insurance but says she still can't afford to go to the doctor when she's sick. She hopes the public health plan New Mexico is considering will change that. "Medicare for all" – often described as a national, single-payer health system built on the Medicare model — has become a rallying cry for some progressive Democrats. Meanwhile, New Mexico is one of several states looking at offering consumers a different type of government-sponsored plan to provide a health care option that's more affordable than current options. These states' proposals are often referred to as "Medicaid buy-in" plans because, typically, they would offer benefits similar to what is available through Medicaid, the state-federal health plan for people who have low incomes. The proposals under consideration vary from state to state. Variables include eligibility criteria, how they might be funded and whether they would be offered on the Affordable Care Act's insurance exchange. And depending on how they structure their plan, states may have to get approval from the federal government to move ahead. States that are interested in a buy-in plan typically are considering taking advantage of the Medicaid program's provider networks and reimbursement rates. Those payment rates generally are lower than for Medicare and for commercial plans. That may help keep costs down, though in some states it also means the network of doctors would likely not be as large as that found with Medicare or some commercial plans. "Medicare-for-all is not going to happen legislatively in the next couple years," says Heather Howard, who directs Princeton University's State Health and Value Strategies program and is working closely with some of the states. "In the meantime, states are saying, 'What about "Medicaid-for-more"?' "
In New Mexico, the buy-in plan would be similar to the state's Medicaid program. It would be offered outside the exchange and would not require federal approval to implement. The state would provide financial assistance to help people with lower incomes buy into it. A report commissioned by New Mexico projected that up to 16,000 people would enroll in a program like the one originally proposed in the state's bills and that their premiums would be 15 to 28 percent lower than plans sold on the individual market. New Mexico Gov. Michelle Lujan Grisham favors a Medicaid buy-in option. She doesn't have a position on the current bill, but she is following it closely, says Nora Sackett, the governor's deputy press secretary. In addition to the governor's and lawmakers' interest, other stakeholders have been deeply involved, increasing the odds of success, Howard says. Lawmakers in Colorado, Oregon, Washington and Minnesota are among others exploring similar options, says Howard. Nevada lawmakers passed a bill last year that would have set up a Medicaid buy-in plan, but the Republican governor vetoed it. "The proposals take on different flavors depending on the state" and what officials are trying to accomplish, she says, whether it's increasing the number of people with insurance, making coverage more affordable or helping states avoid having "bare" counties where no marketplace plans are offered. New Mexico's bill would target individuals who aren't eligible for Medicaid or Medicare and those who can't get the Affordable Care Act's premium subsidies because their incomes are above 400 percent of the federal poverty level (about $50,000 for one person or $103,000 for a family of four). The plan would also be available to state residents whose immigration status in the U.S. is undocumented. And the measure would help people like Gutierrez who are vulnerable to the ACA's so-called family glitch. Her husband's $100 monthly premium for single coverage through his employer plan is considered affordable under the law because it costs less than 9.86 percent of their family's income of about $46,000 a year. That makes her ineligible for premium subsidies on the exchange, even though the $800 premium for the two of them through her husband's employer plan far exceeds that affordability percentage. Their three children already have Medicaid coverage. "Right now, I pay to have the health care, but I can't afford to use it," says Gutierrez. The bill would provide financial assistance from the state, with premiums and cost sharing for people whose incomes are less than 200 percent of the federal poverty level, or $60,340 for a family of five. The new coverage would take effect by January 2021. 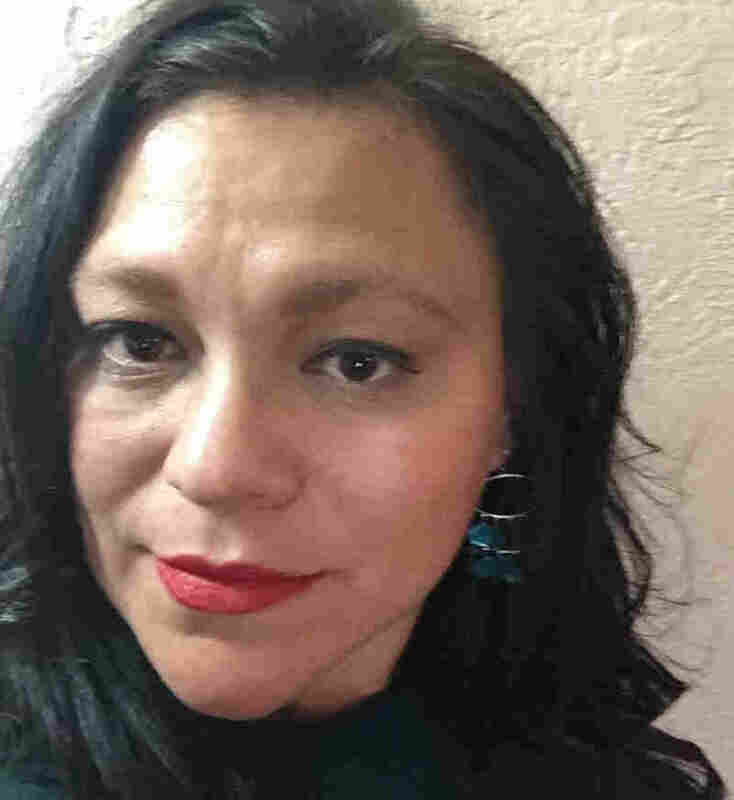 Gutierrez, whose family lives in Albuquerque, would be eligible for financial assistance to help her buy into the Medicaid-like plan, while her husband stays on his employer plan. Because their $46,000 annual income is just above 150 percent of the federal poverty level, her monthly premium would likely be about $160 per month for a comprehensive plan with a $150 deductible, according to estimates by Manatt Health, which did the original state analyses of buy-in options that were published before the bills were introduced in January. New Mexico has high levels of poverty, and 40 percent of New Mexico residents are already enrolled in the state's Medicaid program, compared with about 23 percent nationwide. "It's the cornerstone" of our health care system, says Colin Baillio, director of policy and communication at Health Action New Mexico, an advocacy group. The legislation would use "those levers that Medicaid has to provide comprehensive coverage and a comprehensive provider network." The bills were passed by two legislative committees this month, with instructions for further study to examine expanding the buy-in plan to more groups. They now move to two other legislative committees for consideration, Baillio says. And though hospitals and other health care providers would be reimbursed at Medicaid rates — typically lower than those for commercial plans — to the extent that people who are uninsured enroll in the new plan, some providers say they stand to gain financially. "We're obviously very supportive of anything that expands coverage," says Jeff Dye, president of the New Mexico Hospital Association. "It's the issue of getting some payment versus no payment for services rendered." If the Medicaid buy-in bill passes, Blanca and her husband, Hugo, could have health insurance for the first time since they moved to New Mexico 14 years ago. The couple and their oldest son, now 18, are undocumented immigrants from Mexico. (NPR is not using their last names, to protect the family's privacy.) Their two younger children, who were born in the United States, are enrolled in Medicaid. Hugo works as a plumber, and Blanca is studying early childhood development at a community college near their home in Albuquerque. Because they are unauthorized immigrants, they're not permitted to buy health insurance on the ACA exchanges, even if they're willing to pay the full price. So like many people without insurance, they wait until they're really sick before seeking help. When Blanca developed pneumonia a few years ago, the waiting lists for an appointment at community clinics that would see her without insurance were long. Finally, when she could no longer breathe comfortably, she went to the emergency department. "It would bring us peace of mind not having to worry about our health care situation," Blanca says through an interpreter. Providing health care for residents who lack proper immigration status is "an underlying issue with many states that are considering a Medicaid buy-in," said Chiquita Brooks-LaSure, managing director at Manatt Health, who co-authored the reports evaluating Medicaid buy-in options for New Mexico. The New Mexico bill also would provide some relief for Leah Steimel's family. Neither she nor her husband has employer-sponsored coverage, and with a family income of about $100,000, they don't qualify for tax credits that would reduce their ACA premiums. They now pay more than $1,900 per month for a silver-level plan with a $10,000 deductible to cover themselves and two of their kids (the third is older than 26). Buying into a Medicaid-like plan would be tempting, says Steimel, who works as a community health consultant with some of the groups advocating for the buy-in. Sure, she says, she does wonder if the Medicaid plan would be as easy to use as a regular commercial plan and if it would give the family access to as many providers. "But being able to pay into something that would reduce by even a third what I'm paying now — I'd love that," she says. Kaiser Health News is an editorially independent news service that is part of the nonpartisan Henry J. Kaiser Family Foundation and is not affiliated with Kaiser Permanente. Michelle Andrews is on Twitter: @mandrews110.